Only 8 percent of CPAs believe that the profession is future ready, according to CPA.com’s study Welcome to the Fast Future. This is a rather concerning statistic because the future is coming, and it might be closer than you think. Bill Sheridan, Chief Communication Officer at the MACPA, is on the front lines trying to prepare CPAs for the future, and he recently published a new white paper that every CPA should read: Human Work in the Ages of Machines: Five Steps for Building a Future-Ready Finance Team. Basically, the paper asks what happens when more and more of the things that accounting and finance professionals are trained to do are being done by machines, and what does that mean for our profession? Because these technological changes are going to happen whether we like it or not, there’s nothing we can do except learn how to do the things that machines can’t do and work with them (or go out of business). We have to go beyond being just number crunchers and become number interpreters; we have to be able to understand what we’re viewing and become better communicators. The futurist Peter Sheehan puts this another way: we’ve entered an age when humans should only do work that only humans can do, and everything else is going to be automated. 6/8 of these skills were also identified in the Horizons 2025 project. We tend to ignore stuff like that until it’s almost too late – until the stuff that is on the horizon suddenly gets closer and is threatening to steamroll us. We waited, and now it’s crunch time. Bill doesn’t believe that the problem with CPAs is that we’re too introverted to learn these soft skills. Bill believes the big problem holding us back is that accounting is a rear-facing profession. We’ve been trained to look in the rearview mirror, and so that’s what we’ve done for decades and decades. Now we’re at a point where we have to start looking through the windshield a little bit more and learn how to become a more forward-facing profession, which means figuring out what we need to do to stay relevant tomorrow rather than just accounting for what happened yesterday. Context – What are the big changes going on around us? There’s three hard trends converging: technological advances, changing demographics, and new legislation. Certainty – What can we be certain will happen? The futurist Daniel Burrus says your odds of succeeding go up and the risk of failing goes down, when you start basing your strategy around things that you know are going to happen. Capacity – It’s going to take time for us to learn how to become future ready, and we’re all busier than ever before. But we make time for the things that are important to us. Competencies – As discussed previously, we’re going to have to learn an entirely new set of skills. Key among them is anticipation: learning how to spot future trends before they happen and position our organizations to take advantage of them, before the competition, is actually a skill that you can learn. Core Values – In a world where everything seems to be changing around us, it’s really kind of comforting to know that there are some things that should never change: our core values. The core purpose of this profession, as established by Vision Project, is to make sense of a changing and complex world. Trying to become future ready all at once is overwhelming, and more or less impossible. However, now is a great time to start building future-ready habits. Bill suggests you start with a simple exercise: schedule one hour a week for yourself, and actually put it in your calendar. During that hour, do something like read a book that will help you prepare for the future, or ask your team what productivity apps they like and start implementing them. In the resources below, you will find a number of valuable books and resources to learn from during your weekly time block, including Human Work in the Ages of Machines. Bill: [00:00:00] You know what happens when more and more of the stuff the accounting and finance professionals have been trained to do and have been doing for years are now being done by machines? What does that mean for our profession? 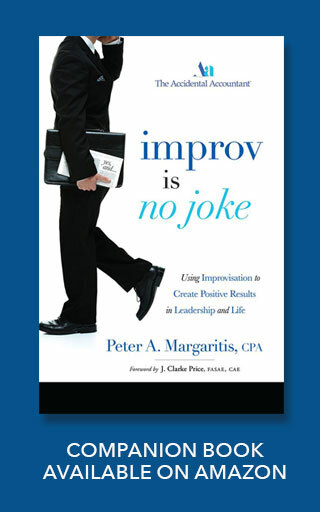 Peter: [00:00:23] Welcome to Improv is no Joke podcast, where it’s all about becoming a more effective communicator by embracing the principles of improvisation. I’m your host Peter Margaritis, the self-proclaimed chief edutainment officer of my business, the Accidental Accountant. My goal is to provide you with thought provoking interviews with business leaders so you can become an effective improviser, which will lead to building stronger relationships with clients, customers, colleagues, and even your family. So let’s start to show. 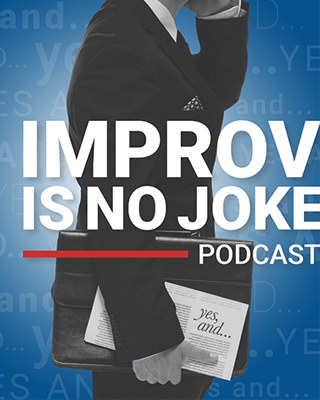 Peter: [00:00:55] Hey welcome to episode 72 of improv is no joke podcast today my guest is Bill Sheridan. He’s a chief communications officer at the Maryland Association of CPAs, and he is now a repeat offender on this podcast. Bill welcome to the podcast. Bill: [00:01:13] Thank you Peter. Good to be back. Peter: [00:01:15] It’s nice having you back. And this is actually this conversation is going to tail from episode 67 that I did with Tom Hood the CEO of the Maryland association. In that episode, he mentioned something about a white paper that was being published by the MACPA. And I got my hands on it and it’s titled Human Work in the Ages of Machines: Five Steps for Building a Future-Ready Finance Team by Bill Sheridan. That’s going to be our conversation today. I want to know more about. I read it. I loved it. It makes sense it’s powerful. It should be read by every CPA in our community and that’s in the speaking global community about how technology is impacting us. So let’s have this conversation about what this White Paper. What spurred you to put this together? Because I know we’ve talked about it in the past. This topic and Tom’s talked about but now that you have it on paper. Bill: [00:02:13] Well first of all thank you for reading. We think the stuff in it is really really important. What spurred it. Well a couple of things. The first is just you know the trends that we were we’re seeing not only in this profession but in the workforce in general. Speaking specifically about technology trends in technology that we’re seeing. Things like artificial intelligence, robots, machine learning… all of these technologies are kind of ganging up on us at once and you know we’ve had our eyes on it for the last few years but it just seems lately that there’s been a lot of buzz about these things and we’re starting to see things like AI and machine learning actually being implemented around the fringes of the profession. So this stuff isn’t science fiction anymore. It’s not. It’s it’s happening. You know you see things like like IBM Watson being put into into play by folks like H&R Block, for instance, and some others they’re using it for in the audit profession as well so. So these things are here. They’re they’re having a real impact on the profession and they’re doing a lot of the stuff that CPAs have quite frankly been trained to do and have been doing for years and years and years. So you know what happens when more and more of this stuff the accounting and finance professionals have been trained to do and have been doing for years are now being done by machines? What does that mean for for our profession? So that was one that was one thing that we have been watching and I’ve been a little bit concerned about. So the other thing that got us concerned was a report that came out a couple of years ago from CPA.com called Welcome to the fast future. And that report tried to gauge how feature ready this profession was, and what they found was it’s not future ready at all. I mean only 8 percent of the CPAs and accounting and finance pros who are surveyed for that report. Only 8 percent said that they felt the profession was ready and that that really gets us worried. So when you’ve got when you’ve got a kind of that convergence: mass change mass transformation hitting our profession in big ways right now, and the profession itself saying we’re just not ready for it. That said to us we’ve got to do something to help accounting and finance pros get a little become a little bit more future ready. So. So that’s that’s kind of what spurred this on. And our hope is that people will read this and come away with at least the beginnings of a blueprint for how they can start making some changes and become a little bit more future ready. Peter: [00:04:59] Yeah. When KPMG signed the agreement last March I believe it was with IBM the CEO said something along these lines. Cognitive computing is here in the audit team practice and we’ll be able to analyze many more transactions than we’ve ever been able to do in the past. And that statement alone told me that the auditing function is greatly going to change and if I don’t get this team going out to the sampling process digging through invoices… and also that same thought was for bringing it to a current event with Wells Fargo. AI and Watson was reviewing the transactions in Wells Fargo at the rate that they could, would they have discovered this consumer lending fraud action in a much more rapid way how it ultimately happened? So I I mean there’s a lot of unanswered questions out there but I also hear CPAs basically say the P in CPA stands for procrastination. Peter: [00:06:07] And I’m not not going to do anything… I take this back to member IFRS? Peter: [00:06:14] Incentive for retirement soon as the baby boomers would say. Until something happened they weren’t paying attention to it. And then IFRS went away but we still went ahead with the revenue recognition a new standard. And I’ve still run into people today that still don’t believe it’s real and it’s actually happening. Peter: [00:06:36] So this is a challenge. Bill: [00:06:38] It’s a it is a challenge. Tom Hood My boss at the MACPA and and business learning institute. He and I have been out speaking to the accounting and finance pros around the country for a lot of the last year about this topic and generally I get two reactions. One is generally from the from the older folks in the profession who they don’t deny that it’s happening but they don’t think their plan is to ignore it long enough to retire so that they don’t have to worry about it. You know the other reaction that we get is is it quite frankly sheer terror almost. Like they hear about these trends and they’re not prepared for them and they don’t really know what to do next. And our you know our goal is to scare them a little bit but we don’t want him to be terrified about the stuff. You know I mean it’s going to happen whether we like it or, these technological changes. There’s really nothing we can do about it except learn how to do the things that machines can’t do and work with them, and not against them because like I said there’s there’s they’re coming and there’s really nothing that we can do about it except prepare ourselves and learn how to reinvent ourselves a little bit – to go beyond being just number crunchers right and be or like number interpreters; Telling the story behind the numbers doing the things that the machines can’t do. Peter: [00:08:18] And to your point about telling the story behind the numbers that’s going to be that’s going to be hard but I think they even step beyond that is telling that story… because you allude to it in the white paper about translator, becoming a translator. When I ask CPA if they speak a foreign language and I don’t get a lot of hands up and then I ask them if they speak the foreign language of business called accounting. All these hands go up. It’s a foreign language and we have to learn how to translate that foreign language into plain English. So that’s another challenge on top of that. Bill: [00:08:54] Yeah absolutely. I mean you know and we know the machines are great. There’s a lot that they can do that we can’t. They can do this stuff. You know this kind of transactional core transactional functions that we’ve been doing for years. They can do it faster, more accurately than we can ever hope to. But they can’t do everything. I mean humans have a decided advantage over the machines in lot of ways. You know the and it comes from just being human. Able to tell those stories right behind the numbers helping our clients and customers become a little bit more future ready as well, which is something that we can do that the machines can’t quite frankly. I think it was there’s a futurist out there by the name of Peter Sheehan – the deep thinker about this stuff – and he says you know we’ve entered an age when we’re humans should only do work that only humans can do. Bill: [00:09:49] And everything else is going to be automated. And I think that’s that’s really true. So you know that that’s going to require us to kind of rethink how we how we– rethink what we know about learning and about the skills that we possess. I think we’re going to we’re going to have to kind of learn an entirely new set of skills in order to remain relevant going forward. And it’s not the it’s not the technical skills that have gotten us here. I mean you know like I said once that stuff not going to go away overnight, and those technical skills are still make make up of the foundation the core of this profession. They’re still terribly terribly important. But in order to remain relevant going forward, we’re going to have to tack on an entirely new skill set on top of that that’s that’s going to focus more on the human side of business I think. Peter: [00:10:44] You know we have to have the technical knowledge that that will not go away. And we may not have to crunch the numbers but we have to be able to understand what we’re viewing and become better communicators. The human factor. The empathy aspect of the body language and understanding and making that connection and translating, and you know we tend to call it soft skills and you know people just… But I found the way I got people’s attention about this. Said we may call them soft skills but you know what they’re pretty hard to master. Bill: [00:11:20] Yeah. Yeah. And Tom is… He’s fond of calling them hard skills. Soft implies that they’re easy. Right. And there’s nothing about this about these things. Bill: [00:11:37] They’re difficult to learn. Let’s define what we’re talking about here. So Tom Tom did some research of his own recently. He took all of the research that we know is out there about what accounting and finance skills we are going to need in order to remain relevant going forward. And there’s a ton of research out there so this came from the AICPA Horizons 2025 project. He looked at a number of books on the on the topic. One is called The Second Machine Age, which laid out exactly what skills we’re going to need in the age of you know machines and machine learning. Humans are Underrated by Geoff Colvin was another book. Only Humans Need Apply by Thomas Davenport and Julia Kirby. And then there were some other ones. The Fourth Industrial Revolution by Klaus Schwab from the World Economic Forum that that laid out future skills. And then there were a couple reports from the Institute of the future by Marina Garbuz, and finally The 2020 Workplace. So Tom took a look at all of this research that’s been done just recently over the last couple of years and kind of put all of the skills of these different pieces of research focused in on into a matrix to kind of come up with the core eight skills that CPAs are going to need to remain relevant going forward, and what he found was the ones mentioned most frequently by all these different researchers were communications, leadership, Number three was critical thinking and problem solving. The fourth was anticipating and serving evolving needs. Fifth one was synthesizing intelligence to insight; providing the insight to the numbers. What are the numbers telling us? The sixth was integration and collaboration. Seventh was being tech savvy. And he kind of combined data analytics into that one as well. And finally functional and domain expertise. So again those are some of those technical skills that were that we were talking about. But that’s that’s you know seven of those eight skills are are are things that you know you’re your stereotypical accounting and finance pro may not have mastered up to this point. So. So those are the types of things that all of the research that we’re seeing are is telling us are going to be critically important going forward. Peter: [00:14:14] And the first in the first six that you read were the exact same that came out of the Horizon’s 2025 project that was published 2010 2011, if my memory serves me correctly because I was on council at the time. So Tom created this matrix and was looking… so that the research that was done… so it was published in 2000 10 that research was done 7 8 9 10 more… and we’re in 17. It’s still relevant. The research that was done. Bill: [00:14:42] Unbelievably relevant I mean it’s that that was the really cool thing about the Horizon’s project. I don’t think most people in the profession grasped at the time: they were trying to make this profession future ready six seven years ago. Right. I mean they they understood what was coming and laid out what exactly we need to do about it. And I think what happens typically is we’re all so busy. The business of just getting through the day stuff that something along that line comes along and we think that that’s kind of interesting or you know interesting stuff coming out of the horizons project but then we get sucked right back into the busy work and just trying to churn through all the stuff on our desk on a day to day basis. We tend to ignore stuff like that until it’s almost too late – until the stuff that is kind of interesting on the horizon suddenly gets closer and closer and is threatening to steamroll us. So now it’s getting to be crunch time and people are saying OK what do I actually need to do about this stuff. So yeah I think that’s where we are today. Peter: [00:15:55] I’m going to give the profession a shout out here because even before the 2025 project we had the vision project. That was what was the first year going to look like by the year 2011. And that’s once we got closer to 2011 that’s when the horizon project came out. So we’ve been we’ve been trying to be future ready since the early to mid to late 90s. Bill: [00:16:15] Well here’s here’s something inside of that vision project by the way. That’s where they came up with the the core purpose of the profession. And I tell CBAs what their core purposes every time I’m out talking to them, and very few people have ever heard of this. But in the vision project the core purpose that they designed or developed and this was done at a grassroots level with CPAs throughout the country. The core purpose of the profession is CPAs making sense of a changing and complex world. Now think about that. that are changing in and complex plural that in and this was this was what 99 2000 that vision project came all right. Bill: [00:16:56] They were thinking about this stuff almost two decades ago. And setting this profession up to succeed as the world transforms into our very eyes. So I think that that is very cool that they were thinking that thinking about this stuff for two decades, and yet here we are. And very few of them have actually done anything about it. So. So that’s that’s the next step. Now we we’ve known for a while what’s coming. In the last couple of years especially we’ve seen it accelerate. Now we got to this is where the rubber meets the road. We actually have to make ourselves a little bit more future ready. Peter: [00:17:37] I’m in the middle of just in the middle of the book, Steve Jobs’ autobiography. And it’s interesting that when he talks about the early years of developing the process, of developing the computer, and I was thinking about that as I was reading it last night coming coming back from North Carolina and I was like… it wasn’t that long ago. That was what mid mid to late 70s. And we’re 2017 and I get to that exponential doubling approach – it’s blown up since then. But the question I hear is the computer was supposed to make our lives easier but I’m working harder and harder and harder. So what’s going to happen now if we’re having more machines do the work – will I be working even harder? Bill: [00:18:32] I think in the short term probably the answer will be yes. As you sit down and ramp up your skills that you’re going to need going forward. But ultimately what that’s going to do is help you remain relevant to your clients and customers in ways that the machines never will. Right. So yeah there’s going to be some work that we’re all going to have to do in order to learn these new skills. Bill: [00:19:06] Once we do we’re just going to be that much more well-prepared to do the work that machines can’t do. It’s Yeah I don’t I don’t see us getting less busy, in the short term, and maybe not even in the long term, but I think the work that is going to keep us busy is going to change significantly. Peter: [00:19:29] So my question to you is how do you take an introverted profession, and I’m using this as a broad brush, and teach them extroverted skills? Bill: [00:19:47] Yes. Well that’s that’s that’s a good question. I don’t know that they’re you know… in a way I think that that that stereotype the introverted CPA is a bit overblown. I don’t think they’re any more introverted than anybody else. I think they’re a little… like what I think is the big problem is that it’s it’s a it’s a rear facing profession. Right. It’s it’s a it’s a profession that is built on accounting for things that have already happened. Right. We’ve been trained to look in the rearview mirror. And that’s that’s what we’ve done for decades and decades. And now we’re at a point where we have to start looking through the windshield a little bit more and learn how to become more of a forward-facing profession, and figuring out what we need to do to stay relevant tomorrow rather than just accounting for what happened yesterday. Well it’s laid out in the white paper. Basically, I think this there’s there’s five key steps to doing that. Number one is to understand the context of what’s happening. What are the big changes going on around us? And again we’re talking about… There’s really a convergence of what we like to call hard trends things that we know are going to happen. Technological advances is one. Demographics is another. The changing face of the workforce right. Baby Boomers are on their way out. And now you’ve got a brand new generation get ready to enter the workforce with Generation Z. So the workforce itself is shifting, and legislation. Those those those three things – demographics, regulation and technology – are really… They’re kind of converging at a weird time and kind of forming this this almost perfect storm. Right. So understanding what’s going on with those trends is is is the first step. The second one is what we call certainty. Right. What can we be certain about? What are the things that are happening that we know are going to happen? Because what happens is when you start basing your strategy around things that you know are going to happen, as the futurist Dan Burrus would say, you know your odds of succeeding go up and the risk of failing go down. Right. When you start basing your strategy around things that you know are going to happen. As a quick example, we know that the iPhone 8 and the iPhone 10 or X have just been released. We probably We know that there’s probably going to be another one next year that’s going to be even more powerful than the ones this year. So how can we how can we take advantage of that? Right. And this is just a real simple example but there are things going around going on around us every day that we know are going to happen. We know with absolute certainty that technology is going to continue to advance. We know that regulation and legislation is going to continue to come at us faster and in more groundbreaking ways than ever before. We know these trends around demographics are happening. So how can we learn to base our strategies and what we do as organizations around some of those hard trends that we know are going to happen anyway? Right. So so certainly that’s the second key step. Number three is capacity. It’s it’s going to take time for us to learn how to become future ready. And we’re all busier than ever before. We don’t have time. But I’m I’m a big believer in the idea that we make time for the things that are important to us. Right. If watching three hours of TV every night is important you, you’re going to find time to do that. If getting to the gym every day is important to you, you’ll you’ll make time in your schedule, and this stuff… to be future ready, it’s as important as anything you’re going to be able to do. So how do you create some of that time? And then there’s there’s a million. I mean we could spend all day talking about examples like. And again this is a real simple example but we all use Microsoft Word. Right. Bill: [00:23:57] There’s What about 4000 features and functions in word right now? How many of those do you use? Bill: [00:24:07] And how many did you pay for? You paid for all of them. Bill: [00:24:11] So I’m again real simple example but I’m guessing that there are some features and functions in there that if you learn how to do it well, would save you some time down the road. And that’s true with every piece of technology that we own. And so you just kind of looking at our processes and understanding how we can build in a little bit of extra time just by doing them in a slightly different way, becoming more efficient and effective, and learning how to build in some spare capacity in our already packed work days is going to be hugely important from the standpoint of becoming future ready. Four is the competencies. We already talked about that. We’re going to have to learn an entirely new set of skills in order to do this stuff. Key among them is anticipation, I think. Again, Dan Burrus talks about this over and over again. The idea that the idea of learning how to spot future trends before they happen and position our organizations to take advantage of them before the competition does. And it’s actually a skill that you can learn. That’s going to be a key competency going forward. And the fifth step is– this is the one that I love. It’s our core purpose, our core values. Right the thing… in a world where everything seems to be changing around us, it’s really kind of comforting to know that there are some things that should never change. And those are our core values… and you know I mentioned the core purpose of this profession before: making sense of a changing and complex world. That should be our goal in everything that we do. Making sense of it for ourselves and then making sense of it for our clients and customers too. And in order to help our clients and customers make sense of the stuff, we’ve got to make sense of that ourselves first right. So so those kind of five steps: context, certainty, capacity, competencies, core values – we call them the five C’s. Those are really what we believe are going to be the keys to to kind of wrapping around our arms around all this change of complexity that we’re dealing with. Peter: [00:26:13] And I agree with all of that. I’ll just take a step back for a second and ask you about the introverted / extroverted question. An attendee asked me that point, how do you teach an introverted person extroverted skills? I said honestly were not trying to make you extroverted. We’re just trying to hone your communication. You’re communicating with me now. You have your own style of communication. We’re just trying to hone that and make it much more efficient much more pointed, and also have the ability to connect with another person and increase that level of trust and create that level of respect and and then things get done. But also with that social filter, which I think I eased this person’s mind a bit about doing that. But I see that in order for us to do this… and I believe you wrapped up the paper around this is we have to do a little bit every single day. Peter: [00:27:12] And that took me when I read that piece that took me to that too. Simon Sinek, when he talks about leadership. So you can go take a leadership seminar. That doesn’t make you a leader. You can take what you’ve learned, but you have to apply it every single day to become a leader. Peter: [00:27:31] And that’s long along the lines with this. We can’t procrastinate. We are historians. Peter: [00:27:38] We are historians and we need to move away from the history and help create the future, or be that trusted business advisor that we’ve been talking about for years with our clients, customers, external and internal. Bill: [00:27:58] Now that’s a very good point and a point that Dan Burrus makes consistently is this idea of actually doing some future-focused work on a regular basis to kind of train ourselves to be doing it right. He is. He’s a big fan of saying that the most important app on his phone is his calendar, because if it doesn’t get on the calendar it’s not getting done. So one of his his ideas — and I love this one I’ve actually done it myself. I tell anyone I speak to to do it. Schedule an hour with yourself every week, an appointment with you once a week, where you do nothing but think about the future, In some way shape or form. Read one of the books in your research papers that we’ve been talking about and get informed about what’s going on in the world around us. Learn how to use a new productivity app. Right. I mean talk to talk to your team and ask them what what’s your favorite productivity app. Have them show it to you and show you how to use it. That’s going to help you save some time down the road. That capacity question that we talked about. Think about what’s happening around us and how it’s going to impact the profession, because disruption is most likely going to come from outside of our profession. Right. We’re we’re not going to disrupt ourselves. Most likely it’s probably somebody out there who’s doing something right now that’s going to completely turn our world around. Right. So what might that look like is when it gets here? So you know just just an hour a week to start thinking about these big questions. How am I going to start changing myself and my organization to to take advantage of the changes that we’re seeing? Too often I think you look at this stuff as a problem to be dealt with – something to be scared of. You know new stuff. That’s that’s that’s frightening frightening stuff and change is scary. But you know if we can kind of turn that mindset around and start looking at this stuff as an opportunity, then a whole new world kind of opens up to us. So you know learning to spend a little bit of time on a regular basis thinking about this stuff I think is a great first step to actually doing something about it. Peter: [00:30:15] Two points there. I love that once a week schedule. Think about it. You reference some of the research and you’ve got all your references in the paper, but I will say that I’ve read The Second Machine Age, I’ve read Humans are Underrated, and I’ve read The Future of the Professions. If I could make a recommendation to the audience, The Second Machine Age… it’s a little tougher because it’s written by two Ph.D. MIT computer scientists and that tends to kind of go… it went over over my head. I even went on a ladder and it still went over my head to read the book. But humans are under-rated and future professions was an easy read. It was pointed. Easier. Easier to consume. Going back to bursts and scheduling things. Bill when we first met I would have ever told you that I would consider myself a writer. I’m not a trained writer. I didn’t I didn’t even like to write you know Christmas cards. Peter: [00:31:14] But I I’ve I’ve published a book and what someone told me a while back was if you want to do something you have to schedule that time, put it on your calendar, and do it. I have on my calendar every morning at 8:00 AM for an hour. Write. I’m in the process of writing my next book about financial storytelling. And I consider myself now much more so than ever before a writer. But it took creating that habit and I’ll be honest with you it hurt at first. It really hurt at first trying to become a writer looking at that– but let’s bring in automation. Dragon dictation. Speech recognition software that you can put on your computer. I use that a lot. Put my head set on and I just talk, and the ability for it to recognize after training that my voice went from maybe three four years ago to about 90 percent. Now it’s about 98 percent. So now I’ve saved myself time by getting it out on the screen by talking through it. Now I go through the excruciating part of editing it, but it’s saving me time. The technology piece. Bill: [00:32:31] Yeah yeah yeah. I mean that’s the great thing about technology today is that it learns as it goes along. You know and it just makes us that much more efficient. And I think that’s a great example. You talk about how how to build some capacity in there, but you’re dead on with writing. I mean I’ve spent my life as a writer. I was a journalist back in the day before I went to work with the MACPA and it’s never gotten any easier. It’s it’s it’s a it’s a hard hard thing to do. And a little intimidating to look at a blank screen and try to fill it up with words is difficult. But but doing it… The key to doing it is to do it. right? Seth Godin. And this applies beyond just writing, but Seth Godin was talking about blogging. He said if you’re good at it, some people are going to read it. If you’re not good at it and you keep doing it, you get good at it. Right. So that that’s all goes back to practice makes perfect right. And that applies to anything. It applies to becoming future ready, a concept as nebulous as that. Just just getting yourself in the habit of doing something every day or every week it’s going to help you prepare a little bit more for what’s coming in. And by extension help your clients and customers prepare for what’s coming. Just doing it makes you better at it. Peter: [00:33:59] And I know the MACPA has this anticipatory organization, anticipatory CPA program that’s used because I when I was on vacation in Florida, a gentleman who’s a managing partner of a large regional firm based out of Youngstown, but in Sarasota he and I had breakfast one morning while I was on vacation since I was nearby. And we were talking about the profession, we’re talking about differences are going on. And he said yeah this whole anticipatory organizational — woah woah. Say that again for me. And I went do you Tom Hood? He goes yeah I know that’s who they came up and did the… our managing partner has been on this anticipatory thing for years and you guys came up and he said he absolutely loved the program. It got him thinking completely different. And it was so fresh and so new that everybody was just excited about it and have just taken that ball and run with it. Bill: [00:35:05] We’ve gotten a lot of people who expressed interest in finding out more about it – how can I become more anticipatory? How can I learn to spot future trends early and take advantage of them? Because they’re starting to understand. That’s really one of the keys to becoming future ready. So it’s it’s just I think it’s a case of the right idea coming along at the right time. Our hope is that more and more folks will will take a look at it because we think it’s a really powerful tool for helping you and others become a little bit more future ready. Peter: [00:35:40] Yeah. I thoroughly agree and I I hope that my audiences listening to this will pass this episode on to colleagues in the profession. Have them listen to it as well. We will have the white paper in the show notes and on my web site that they can download and grab, and take it – read it, and spend some time thinking about it on how you can start today in the fall of 2017. And what can we do a little bit every single day to become more future ready? And this is a great blueprint to get people to think. Bill: [00:36:22] Thank you for that. We think it’s important. And our goal is to make the rest of the profession think that it’s important as well because you know in a lot of ways, the future of the profession kind of depends on it. Peter: [00:36:41] Let me take you down this path because I think one of our challenges as a profession is to be future ready, we need to change the accounting curriculum at universities. Bill: [00:36:55] We could we could spend like three or four hours talking about education and what needs to be done there… talk about a profession that that isn’t future ready. I think there’s a lot of work that needs to be done. Not just in accounting education, but just in education in general because, in a lot of ways, we’re we’re we’re as you know we’re trying to educate people to become future leaders with tactics that are centuries old. Right. So so yeah I think you’re absolutely right. We do need to take a look at what we’re teaching kids not just and, not just the university but but in high school and even earlier. What things are they really going to need? Seth Godin. Another one. I I keep going back to Seth because he’s just brilliant I believe. But he wrote a book one time. He’s written a number of books that this book was called Indispensable, I believe that might not be the name but I’ll go look that up. But in it, he put he put forth his his idea of what the future of education should look like, and it’s a little radical. He says the only thing that we should be teaching our kids is leadership skills and problems solving, how to solve really hard problems. Everything else they can find online. Right now I think there’s a… I think that’s going a little further out than even I’m prepared do. But the point is yeah I think we need to take a good hard look at how we’re educating folks to become ready for tomorrow because, in a lot of ways, education is still stuck in yesterday. Peter: [00:38:36] Well, if you think about it, the way the current system is set up when they come out, the responsibility now is to teach them today versus what was taught is now on the employer. The employers will have to invest much more… a lot more money into their employees to get them future ready no matter what profession they go into. Bill: [00:39:00] Yeah I agree. I think there is that the employers do share a good chunk of responsibility for making sure their teams have the skills that they’re going to need. I think there’s a lot of personal responsibility as well. Myself, as as an employee. This is my career we’re talking about right. My future. So if I’m not getting the skills from my employer, where am I going to get them? And take it upon yourself to get out there and ensure that you know that you’re you’re going to remain relevant going forward as well. So I think responsibility for doing the stuff… I think it lies with everybody quite frankly. Peter: [00:39:40] And even those who are going to be retiring out of the profession – leave better than when you got it. And don’t turn a blind eye. Invest in the people, give them the skills that they need so they can be successful, and your organization can continue to grow. Bill: [00:39:59] Yeah believe it or not I’m just now reading Good to Great by Jim Collins. That’s one book that has just escaped me. But he makes a point you know to the leaders of great companies spend more time on the people side of the equation and preparing to turn their organizations over to really talented folks when they lead. Right. It’s all about succession and surrounding yourself with the best people possible. And a lot of that is making sure that they have the skills to continue to grow going forward. Peter: [00:40:30] I’ve heard that you want to be that you want to be the weakest link amongst your five closest confidants. Bill: [00:40:40] Yeah. That’s that’s a that’s a great that’s a great analogy. Peter: [00:40:44] And I’m really good at being the weakest link amongst my 5. Bill: [00:40:48] I’m brilliant at it. What’s that old saying that you know if you’re the smartest person in the room, you’re in the wrong room. You want to surround yourself with people who are way smarter than you. And because that’s you know that’s how things get done. Peter: [00:41:05] Well I was going to close then of you by asking you because I’m always fascinated, What are you reading these days, But you are you alluded to Good to Great, and I still haven’t picked that book up but that’s that should be something I should read. What have you read lately? Bill: [00:41:22] Well let’s see. I had actually been doing a lot of reading from a series of books from an organization called EOS, which stands for the entrepreneurial operating system, but they’ve got a series of books about you know how you can get more out of your business. And some great tools for how to do that, and so I’ve been reading… one of them is called Traction, which is just a great kind of business book that lays out this system for for getting more out of your business from start to finish. So that was really good. The other one that was almost life changing in a way it was just such a fantastic new book is called Thank You for Being Late by Thomas Friedman, who is he’s also a Pulitzer prize winning columnist for The New York Times, and he spent a lot of time talking about the change and transformation that we’re seeing in the world today not just from things like Moore’s Law which you alluded to earlier. That’s the idea that computing power doubles every every two years or so and that’s what’s what’s leading to all of this transformational change. But he’s also talking about societal changes as well, with things like climate change and how all of these things are kind of dovetailing to make our world really really complex so thank you for being late was was just an eye opening book for me. I highly recommend that. Peter: [00:42:42] Freidman He was he wrote… was he the one who wrote The World is Flat? Peter: [00:42:46] OK. OK. OK. Have you read the book by John Medina called Brain Rules? Bill: [00:42:53] No no no. Peter: [00:42:54] You should pick that up and read it. It’s He’s he’s a neuroscientist that actually wrote about the brain book, but put it in a language that we all can understand. And this was introduced to me through a professor of psychiatry at Michigan State University, who was the past president of the National Speakers Association. He came to talk to our chapter and it talks a lot about how… he put in the context of presentations. PowerPoint were more visionary and just gave me some really interesting ideas and thoughts. And I I read that book I was as fast as I’d become fascinated by how the brain works and how the more or less how the audience brain reacts to things that we do, in order to make it easier for them. And then the one that I’m reading now I finally picked up and started reading Steve Jobs autobiography and I’m kind of taking the Steve Jobs approach today. I’m barefoot at work and I haven’t showered today, but that was fascinated me about him. I didn’t realize. I mean he wouldn’t bathe for a week or so. Bill: [00:43:59] It’s that that kind of mad genius thing going on is. Who was it Einstein who had like seven copies of the same suit. So he wouldn’t have to think about what he was going to wear or something like that. I forget if it was Einstein or somebody else. But yeah you know that’s… I think there’s something to that, that people who change the world don’t spend a whole lot of time thinking about fashion you know. Peter: [00:44:24] Right. Well cool. Well Bill thanks very much for spending time I know that you’re very busy because I heard your slack noise go off in the back. Bill: [00:44:33] I apologize for that. I had to shut it down. Peter: [00:44:35] No worries. I’ve been I’ve been introduced to slack from my producer. He likes to communicate with his clients that way. So when I heard that noise. Oh. And you get a lot more slack correspondence I know than I do. Bill: [00:44:48] And it sometimes can be a little overwhelming and I just every now and then I got to shut it off so I can get some actual work done. But yeah it’s been a lot of fun. Thanks for having me. I appreciate it. It’s always good to talk to you. Peter: [00:45:01] Any time. And and I will make this plug. I don’t know the date yet and maybe Bill can share that. But the MACPA is coming out with our own podcast here in the very near future. Bill: [00:45:14] Yes yes. We are still in the very early stages of planning it. But again it’s going to be kind of focused in on this notion of being… how to become future ready right. And we talked to so many people and heard so many leaders kind of expound on this subject that we thought it would be fun to have conversations with them and share some their ideas for how this profession can kind of move down that road. So look for that hopefully at some point this fall or winter. We will start rolling out. Peter: [00:45:50] In episode 73, my guest is Dr. Alan Patterson, who’s the author of the book Leader Evolution: From Technical Expertise to Strategic Leadership, and is one of the business learning institute’s thought leaders.